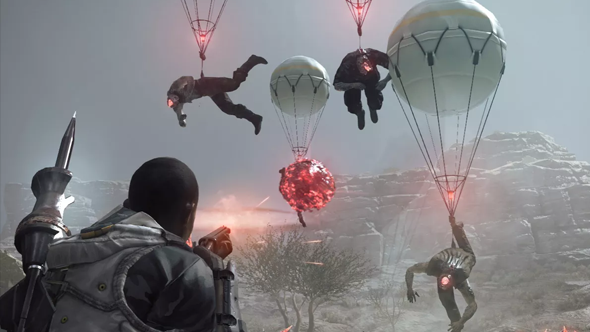 45 minutes of Metal Gear Survive gameplay has been released. IGN Japan posted the footage, which seems to cover some aspect of the game’s story as well as gameplay. You can see the full 45 minutes in the video above. Here’s the name of Metal Gear Survive’s shadowy government agency. Over the course of the footage, we get to see some of the game’s barren, but detailed, open-world. If you played 2015’s Metal Gear Solid V, much of the game’s presentation will at least be familiar, with a similar visual style and some aspects of the UI carrying over. At the early stage of the game that the footage seems to take place in, there aren’t many of the gadgets that you had access to in MGSV, but a few briefs looks at the crafting menu suggest there’s room for expansion later on. Unlike MGSV, however, the wildlife is given a pretty tough time – towards the start of the video, the player stabs a sheep to death with a pointy stick (that’s around 2 minutes in, if that’s what you came here for). There’s also a brief opportunity to explore the reasonably detailed character-creator, and a look at combat. With no guns to speak of, that’s pretty much limited to bashing crystal-headed zombies with a stick through a chain link fence, but there’s also some stealthing around the 29-minute mark. More or less everything on display, other than a few aspects of the UI, are in Japanese, so it’s a little difficult to tell what’s going on. You can put English subtitles on, but they don’t seem exactly accurate.